Yesterday we were thrilled to reveal that we have been selected as part of The Audacious Project, a philanthropic collaborative organized by TED! You can read all about our project here. In short, we are expanding our institute into a global hub of innovation so that we can apply protein design to some of the most pressing challenges facing our species. 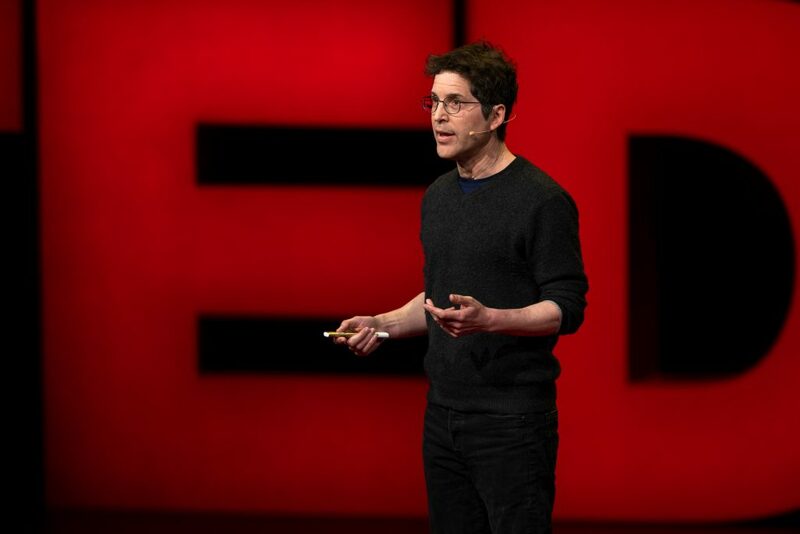 David Baker gave an inspiring talk live on the TED stage in Vancouver, BC, where he laid out his vision for the project. Check back soon to find links to the full talk online. Readers of Nature’s News & Views selected an article about our work as their 2018 Reader’s Choice! The article, written by Roberto Chica of the University of Ottawa, does a fantastic job detailing our recent publication on de novo fluorescence-activating proteins — and the challenges of de novo protein design more generally. “The development and application of this computational method for designing β-barrel proteins that bind small molecules is the first demonstration of the de novo design of both protein fold and function, a milestone in the field. 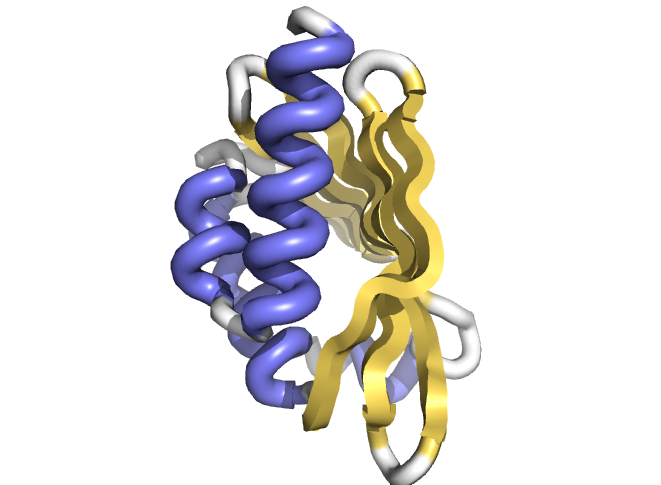 Previous computational designs of ligand-binding proteins relied on building a binding cavity into a protein template found in nature, or one that had previously been created in the laboratory. 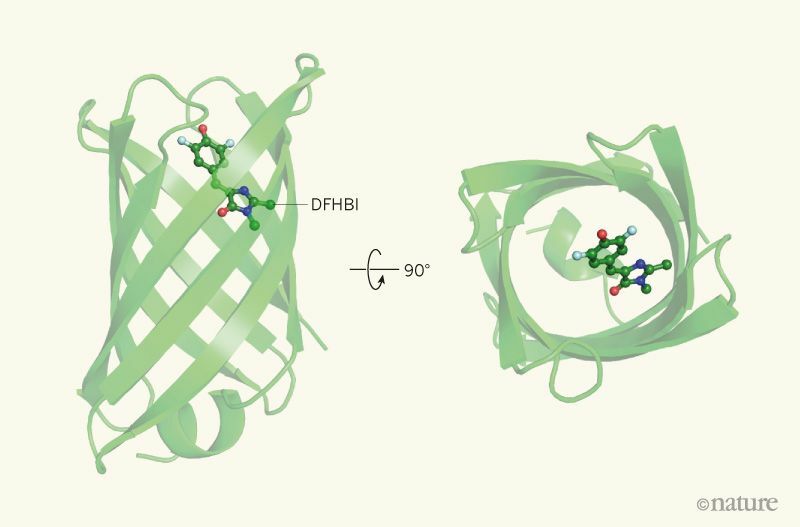 By contrast, Dou and co-workers have designed a β-barrel protein that has a shape distinct from those found in nature, and constructed a binding pocket that is specifically tailored to a target small molecule. We thank Chica and the News & Views readers for their interest in our work. Update 2018-07-26: The 2018 SCI-STEM Symposium was recently featured in an eLife article. 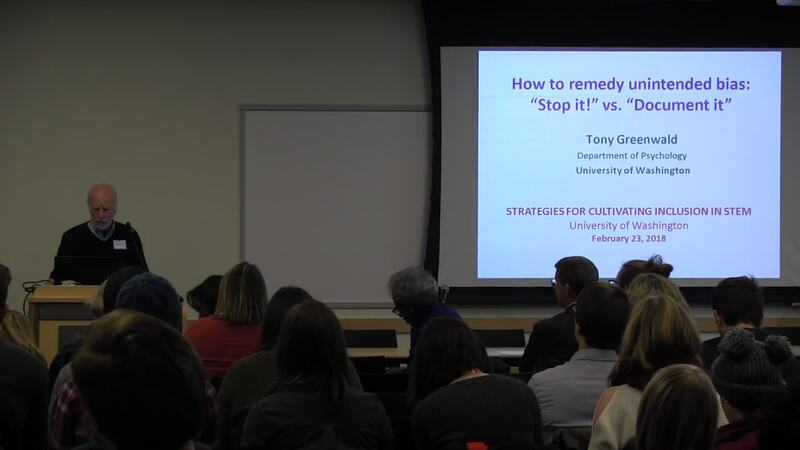 The Institute for Protein Design at the University of Washington held its first ever symposium aimed at providing strategies to address diversity challenges in science, technology, engineering, and math (STEM). 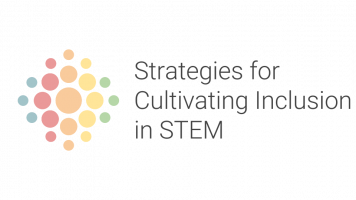 The Strategies for Cultivating Inclusion in STEM (SCI-STEM) symposium featured leading keynote speakers, panel discussions, and interactive breakout sessions. Members of the STEM community at all levels, from undergraduates through senior scientists, deans and heads of departments at the university attended. As a technical institute dedicated to the pursuit of knowledge and discovery, we know first-hand that innovation in STEM requires bringing in new perspectives to difficult problems. Research groups that create and successfully maintain workplaces where all voices are heard will continue to outperform those that don’t. 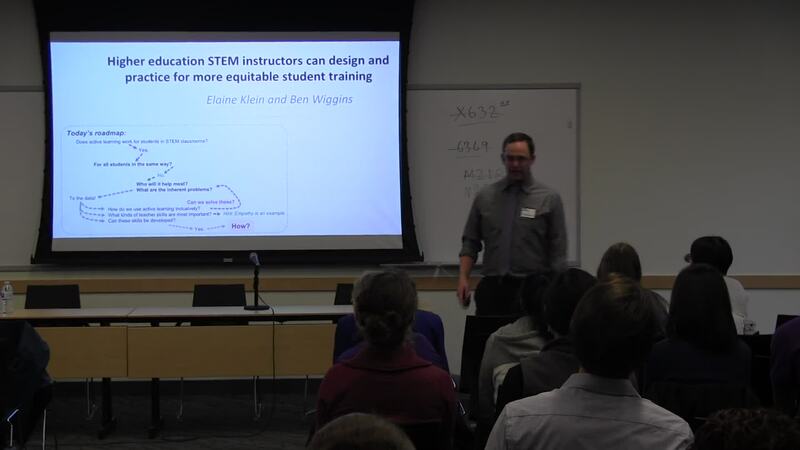 This website showcases some of the conversations and lectures held at this inaugural SCI-STEM and we hope the extended community at UW and beyond can benefit from the practical tools, data driven ideas and methods proposed towards cultivating a more inclusive workplace. We invite you to keep the conversation going on social media using the hashtags #diversifySTEM . 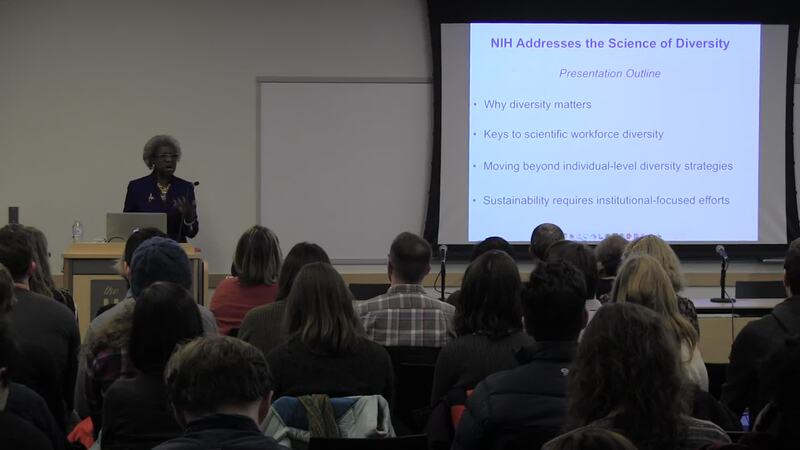 Download Slides: NIH Addresses the Science of Diversity: Focusing on Institutional Change and NIH Scientific Workforce Diversity Toolkit. 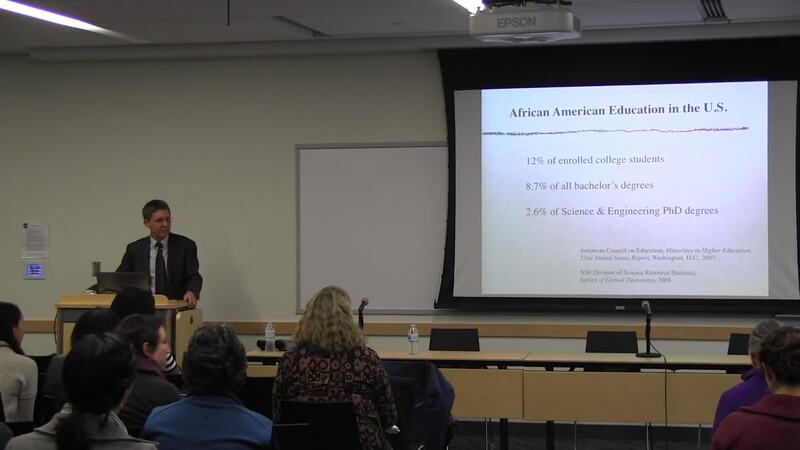 Download Slides: Higher education STEM instructors can design and practice for more equitable student training. 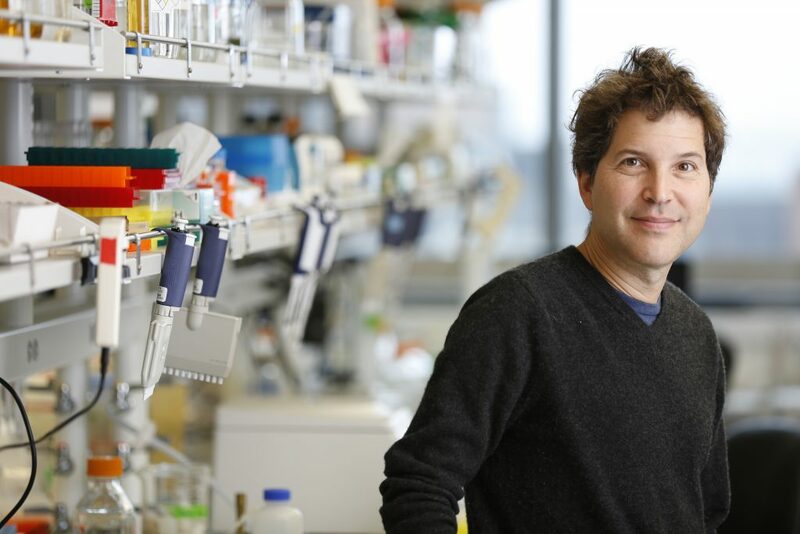 At the end of a historic year for protein design, the Baker lab was honored to be profiled in the New York Times by famed science writer Carl Zimmer. Zimmer writes about the technology, progress and promise in the field, noting the contributions from our wonderful crowdsource participants. On the technology front, Rosetta continues to improve year over year thanks to the hard work of the RosettaCommons. Given ongoing advances in DNA synthesis and protein screening technology, there is still so much more we can design and discover. Progress in the field of protein design was staggering in 2017. 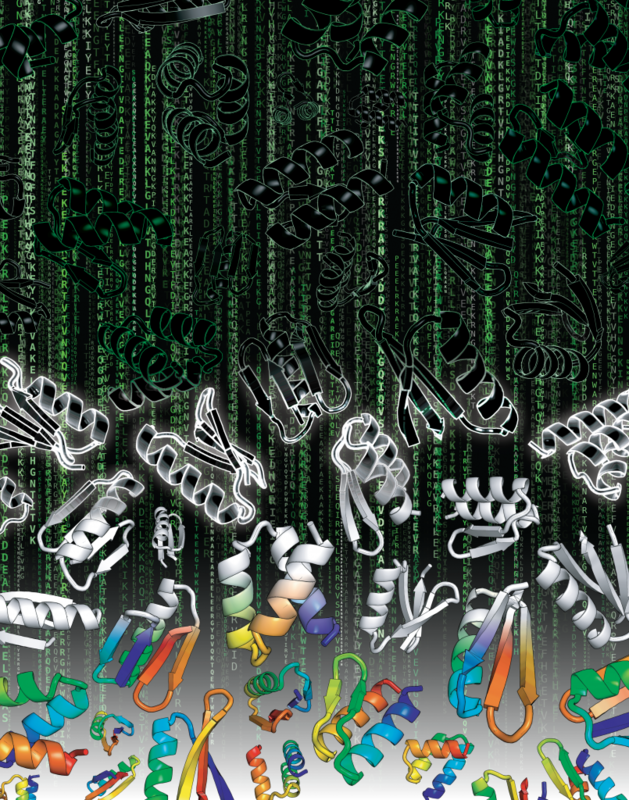 Thousands of de novo proteins were produced, with new features, folds and functions. From immunotherapy, drug delivery, anti-viral activity and more, this truly was an awesome year for applied protein design. Some of the key functions of the proteins in our bodies and in all living things are to catalyze chemical reactions—speed up the rates by many orders of magnitude-and to sense and respond to small molecules in the body and in the environment. New proteins that catalyze chemical reactions and/or sense and respond to compounds not found in nature would have wide use in medicine and industry. Computational protein design can in principle be used to generate such new catalysts and receptors, but a major challenge to accomplishing this has been the inability to design proteins with cavities within which the catalysis or small molecule binding can take place. This paper describes a general approach for designing proteins with cavities with tunable size and shape. The method opens the door to design of new catalysts and binding proteins [by generating proteins with appropriately sized and shaped cavities to hold the small molecule and lining the cavity with amino acid functional groups to carry out catalysis and/or binding]. Read the UW’s HS NewsBeat write-up here. Read the original post about their spin-out here. We are happy to congratulate Ingrid Swanson Pultz, an IPD Translational Investigator, and Clancey Wolf, a Research Scientist, on PvP Biologics‘ spinout! The news was announced this morning and has been circulated through various outlets. The company, created in 2015, is focusing on advancing KumaMax, a gluten-fighting enzyme that could potentially be taken orally to help those with Celiac disease. To learn more about the announcement, read the full article here. Published today in Science Philanthropy Alliance, David Baker, Director of the Institute for Protein Design describes how the opportunities for computational protein design are endless — with new research frontiers and a huge variety of practical applications to be explored, from medicine to energy to technology. 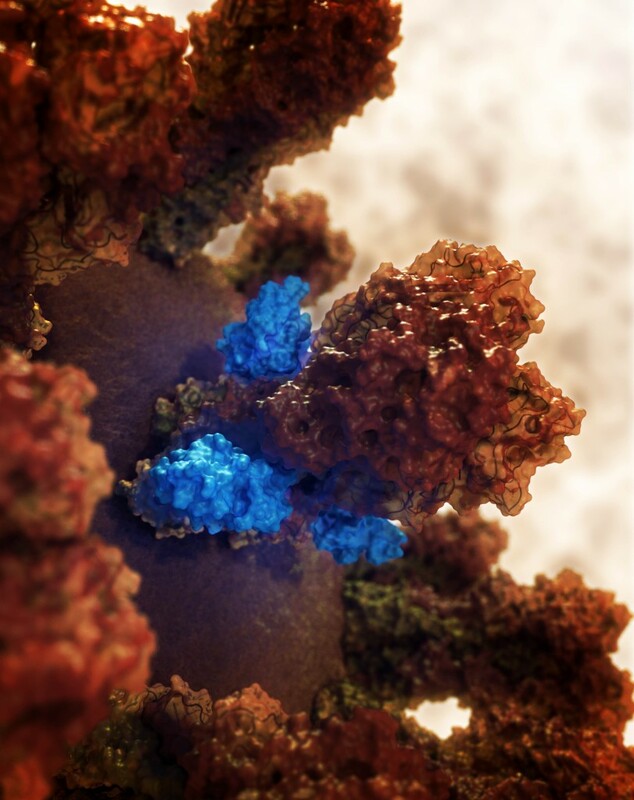 This is an exciting time as we are undergoing a technological revolution in protein design—rather than simply tweaking proteins that have come through the evolutionary process, we are becoming able to design new proteins from scratch to solve current challenges. 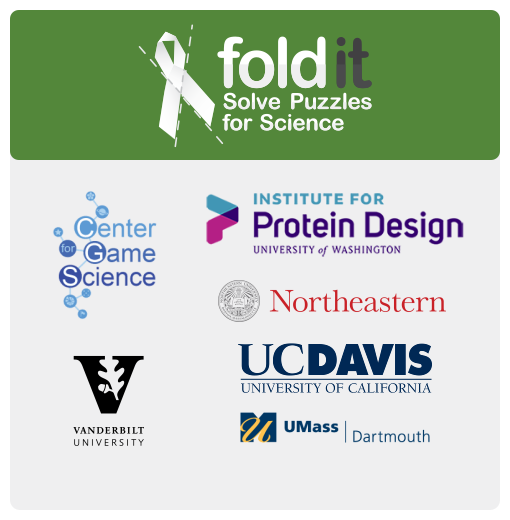 It was a great year for the Institute for Protein Design and we couldn’t have done all of our amazing work without the support from our donors and contributors! Thank you to everyone who helped us, whether through a donation, collaboration, playing Foldit, or otherwise. We’ve filled the IPD Newsletter with all of the progress we’ve made in 2016, so take a look! In the PDF there are links to articles and publications, but many of them can also be found on either this website, or at www.bakerlab.org. Please continue to watch our growth as we head into 2017! General design principles for protein interaction specificity are challenging to extract. 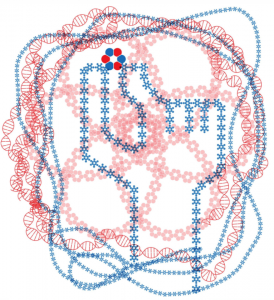 In DNA, specificity arises from a limited set of hydrogen-bonding interactions in the core of the double helix to design and build a wide range of shapes. In proteins, specificity arises largely from buried hydrophobic packing complemented by irregular peripheral polar interactions. Protein-based materials have the potential for even greater geometric and chemical diversity, including additional functionality. Here we describe a general approach for designing a wide range of protein oligomers that have interaction specificity determined by modular arrays of extensive hydrogen bond networks. We use the approach to design dimers, trimers, and tetramers consisting of two concentric rings of helices, including previously not seen triangular, square, and supercoiled topologies. X-ray crystallography confirms that the structures overall, and the hydrogen-bond networks in particular, are nearly identical to the design models, and the networks confer interaction specificity in vivo. 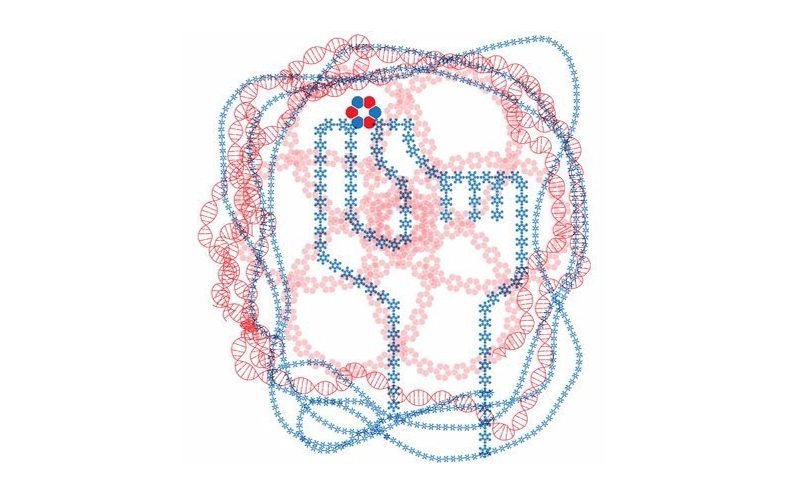 The ability to design extensive hydrogen-bond networks with atomic accuracy enables the programming of protein interaction specificity for a broad range of synthetic biology applications; more generally, our results demonstrate that, even with the tremendous diversity observed in nature, there are fundamentally new modes of interaction to be discovered in proteins. 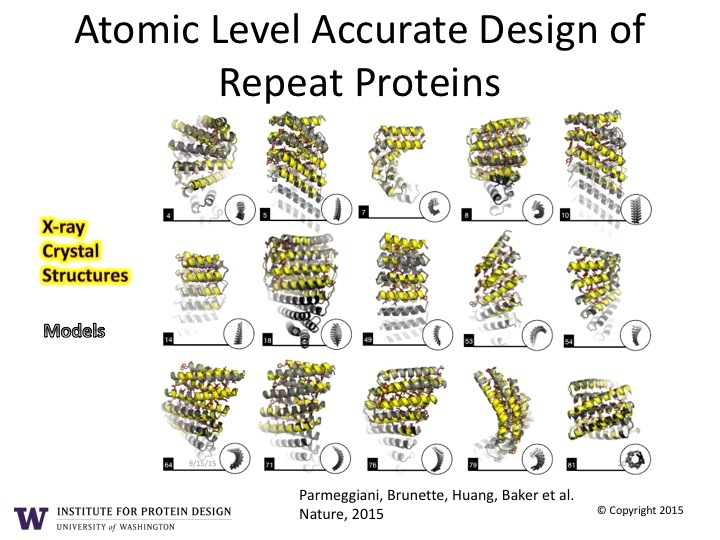 Watch this video to learn more from Scott Boyken on computational design of hydrogen bond networks in proteins. Over the weekend, Foldit had its 8th birthday! 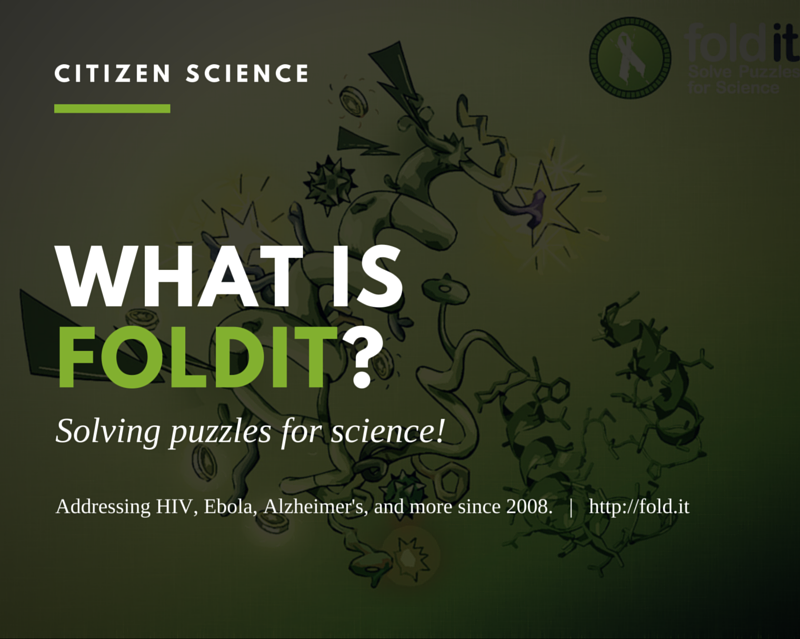 In celebration, they will be tweeting (@Foldit) fun facts and infographics on their feed. Haven’t heard of the game or tried playing it yet? What better time than now! Click here to learn more and to join an ever-growing community that spans the world. 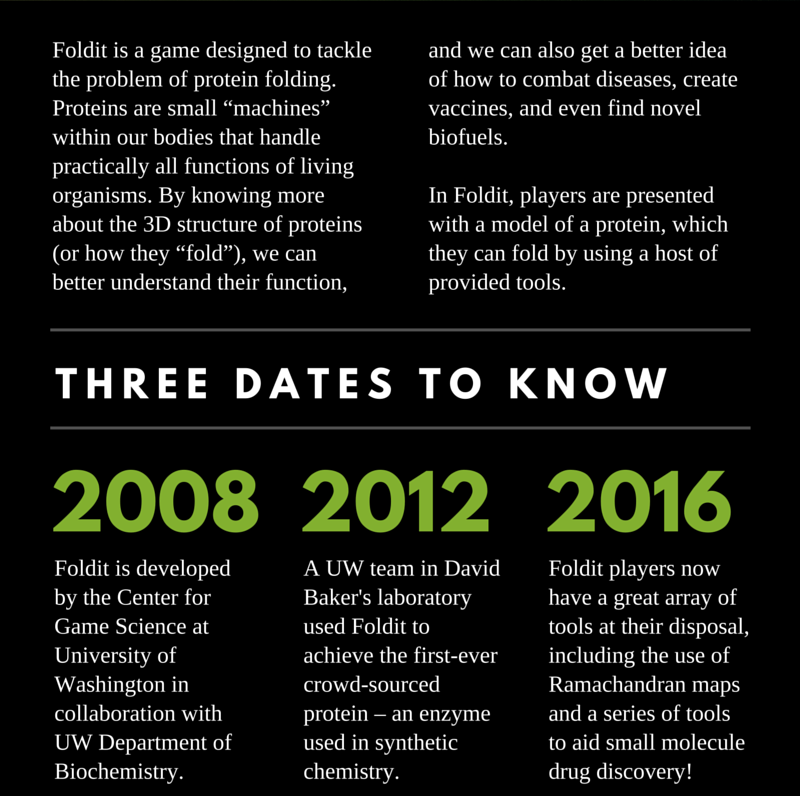 Who knows, maybe you’ll be the person who folds the protein that will help create a way to fight disease! As technology improves and Americans spend more on treatments to cure or prevent disease and injury, 2016 is likely to be a challenging year in health care. Doctors, nurses and clinicians are learning to work in new and innovative ways as consumers rely on video consults and their smartphones as diagnostic tools. 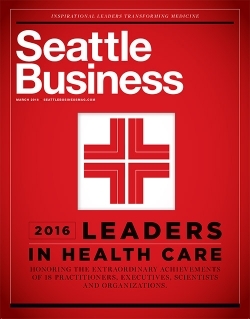 The 18 honorees in Seattle Business magazine’s 2016 Leaders in Health Care Awards are up to the challenge. All are champions for change, compassionate visionaries who believe in better patient care. They are harnessing technology, tackling the unknown and solving scientific puzzles — all in the name of promoting health and lowering costs. They are forward thinkers who excel in the delicate balancing act involving the health, lives and resources of consumers. Congratulations to this year’s honorees for their commitment to ensuring Washington’s health care industry remains at the forefront of worldwide achievement. There is also a separate article about David here. Additionally, back in January, David was listed amongst Thomas Reuters’ list of “World’s Most Influential Scientific Minds” for 2015. He was one among 27 UW faculty members that made the list, which is determined by most citations by peers for various fields. You can read the UWToday article here. David was selected for biology and biochemistry. Naturally occurring proteins are the nanoscale machines that carry out essentially all of the critical functions in living things. While it has been known for over 40 years that the sequence of amino acids completely determines the shape of the protein, it has been very challenging to predict from the amino acid sequence of the protein its three-dimensional structure, and conversely, to come up with brand new amino acid sequences which fold up into hitherto unseen structures. 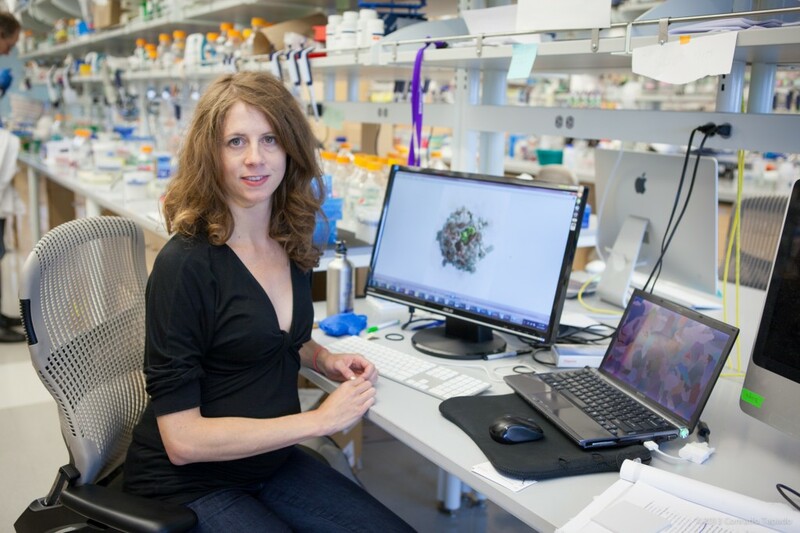 Over the past months, scientists at the Institute for Protein Design at the University of Washington and the Fred Hutch, along with colleagues at other institutions, have reported advances in two long-standing problem areas related to the construction of new proteins from scratch. 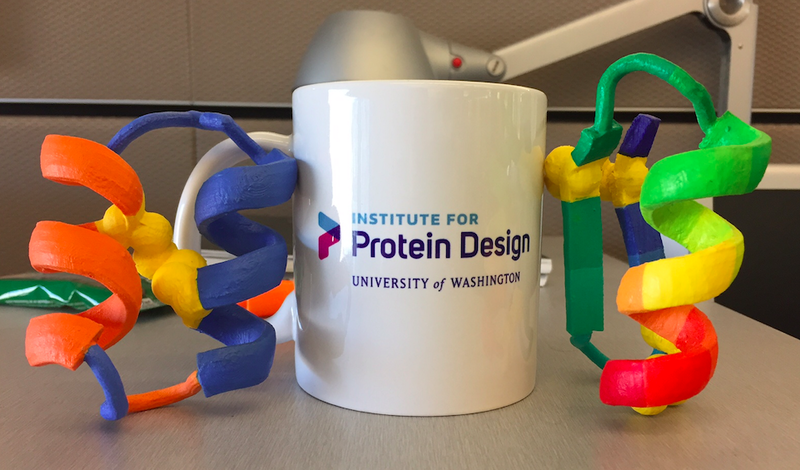 “It has been a watershed year for protein structure prediction and design,” said UW Medicine researcher David Baker, a University of Washington professor of biochemistry, Howard Hughes Medical Institute investigator and head of the Institute for Protein Design. The protein structure problem is about figuring out how a protein’s chemical makeup predetermines its molecular structure, and in turn, its biological role. 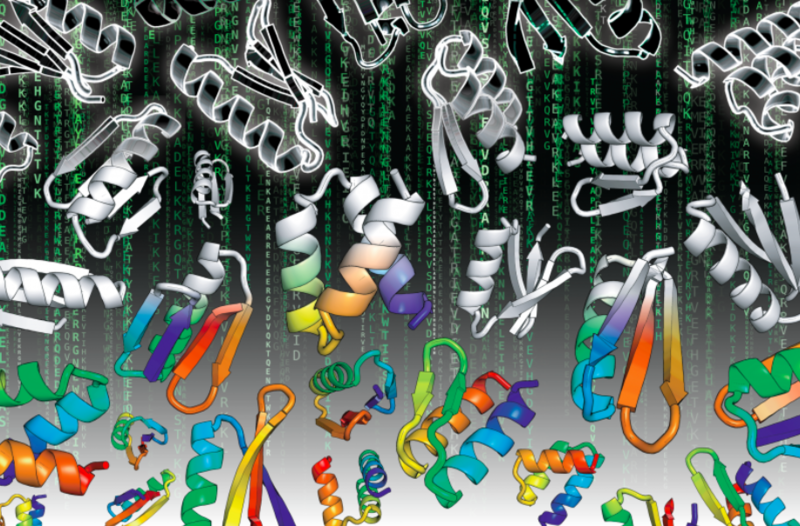 UW researchers have developed powerful new algorithms using co-evolution data from DNA sequences to make unprecedented highly accurate blind ‘ab initio’ structure predictions of large proteins (>200 amino acids in length). This has opened the door to accurate prediction of the structures for hundreds of thousands of newly discovered proteins in the ocean, soil, and gut microbiome. Equally difficult is the second problem, which is designing amino acid sequences that will fold into brand new protein structures. Breakthroughs demonstrate that it is now possible to make brand new amino acid sequences with exacting precision for folds inspired by the natural world; and more importantly to make amino acid sequences from scratch for totally novel unknown folds, far surpassing what is predicted to occur in natural proteins. The new proteins are designed with the help of volunteers around the world participating in the Rosetta@Home distributed computing project. 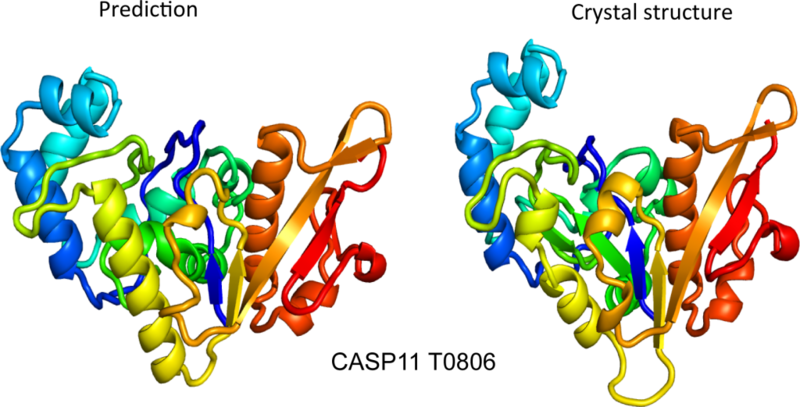 The designed amino acid sequences are encoded in synthetic genes, the proteins are produced in the laboratory, and their structures determined with X-ray crystallography. The computer models in almost all cases match the experimentally determined crystal structures with near atomic level accuracy. Researchers report new protein designs for barrels, sheets, rings, and screws –all with near atomic level accuracy. This builds on previous reports of designed protein cubes and spheres; providing proof that it is possible to make a totally new class of protein materials. 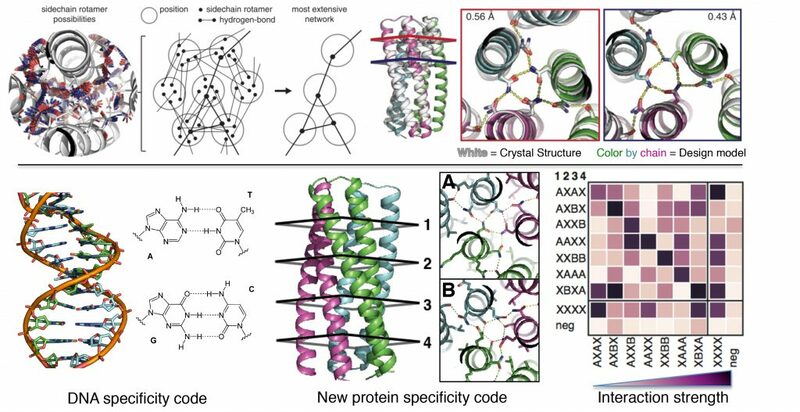 With these advances in both protein structure prediction and molecular design, Institute for Protein Design researchers hope to build a new world of proteins with exact specifications for performing critically needed tasks in medical, environmental and industrial arenas. 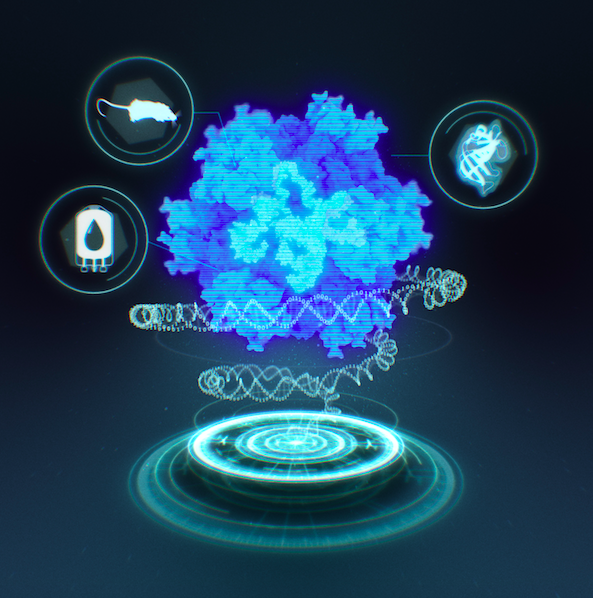 Just as the manufacturing industry was revolutionized by creating interchangeable parts designed to precise specifications, custom designed protein modules with the right twist, turns, and connections for their modular assembly is a bold new direction for biotechnology. Results providing proof of this possible future have been reported in recent months by researchers the UW Institute for Protein Design in collaboration with researchers at the Fred Hutch, Max Planck Institute for Developmental Biology, Janelia Research Campus, and the Institute for Molecular Science in Japan. 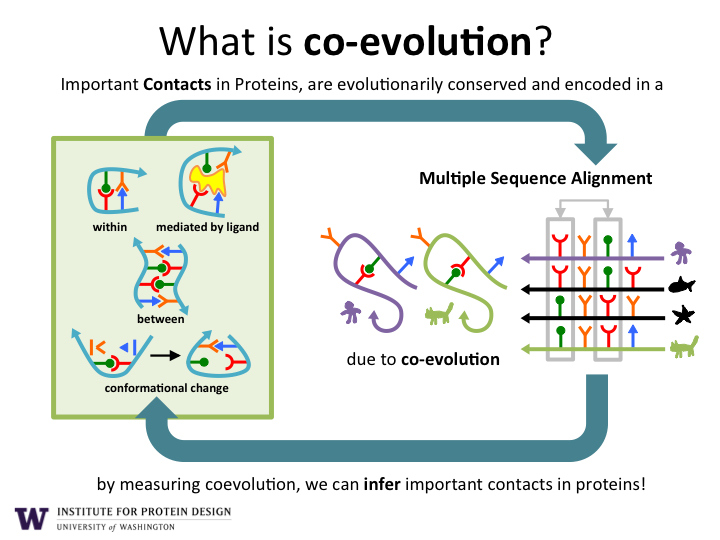 Evolution offers clues to shaping proteins: The function of many proteins tends to stay the same across species, even after their amino acid sequences have changed over billions of years of evolution. 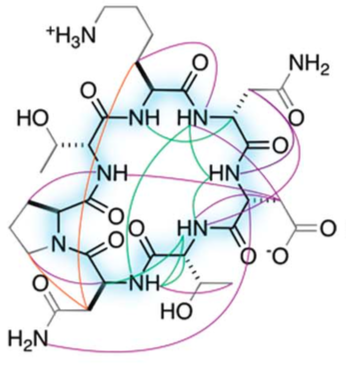 Locating co-evolved pairs of amino acids helps calculate their proximity when the molecule folds. UW graduate student Sergey Ovchinnikov applied this co-evolution DNA sequence analysis in an E-Life paper published on September 3, 2015 entitled “Large-scale determination of previously unsolved protein structures using evolutionary information” that illuminated for the first time the structures of 58 families of proteins containing hundreds of thousands of additional structurally related family members. “This achievement was a grand slam home run in the history of protein structure prediction,” said Baker. Modular construction of proteins with repeating motifs: Proteins composed of repeated modules, similar to interlocking Lego® blocks, are common in the natural world. 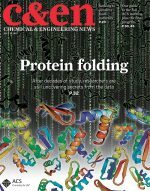 Two papers published in the December 16 issue of Nature entitled, “Exploring the repeat protein universe through computational protein design,” and “Rational design of alpha-helical tandem repeat proteins with closed architectures,” shows that existing repeat proteins occupy only a small fraction of the available space, and that it is possible to design totally new proteins with precisely specified geometries that go far beyond what nature has achieved. 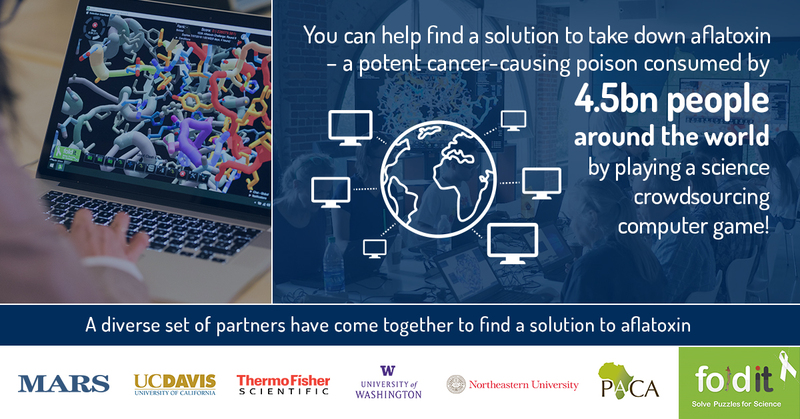 The work was led by postdoctoral fellows TJ Brunette, Fabio Parmeggiani and Po-Ssu Huang in the lab of David Baker at the University of Washington Institute for Protein Design and Lindsey Doyle and Phil Bradley at the Fred Hutchinson Cancer Research Institute in Seattle. Barrel-fold design: , Baker lab postdoctoral fellow Po-Ssu Huang, together with Birte Höcker at the Max Planck Institute for Developmental Biology (Tübingen, Germany) discovered the critical but elusive design principles for a barrel-shaped fold underpinning many natural enzyme molecules. 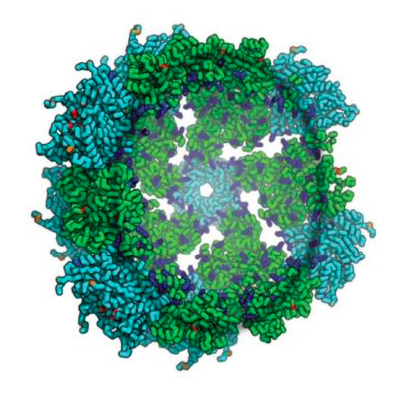 The custom designed barrels folds were built at the Institute for Protein Design and reported on November 23, 2015 in the Nature Chemical Biology paper, “De novo design of a four-fold symmetric TIM-barrel protein with atomic-level accuracy.” This breakthrough has opened the door for bioengineers to generate totally new enzymes that speed up chemical reactions by positioning smaller molecules in custom barrel compartments. Self-assembling apparatus: Naturally occurring ordered protein arrays along a flat plane are found in bacteria, the heart, and other muscles. Overcoming protein interaction complexities, researchers at UW Institute for Protein Design and the Janelia Research Campus of the Howard Hughes Medical Institute succeeded in programming proteins to self-assemble into novel symmetric, 2-dimensional sheets of protein lattice patterns. UW graduate student Shane Gonen in the Baker lab together with his brother Tamir Gonen at Janelia described their work in the June 19, 2015 issue of Science, “Design of ordered two-dimensional arrays mediated by non-covalent protein-protein interfaces.” This research has application in the design self-assembling protein nanomaterials, especially those that could serve as efficient sensors or light harvesters. Precision sculpting: Protein designers are continuously refining the principles for fashioning ideal protein structures. The latest paper in the October 6, 2015 Proceedings of the National Academy of Sciences, “Control over overall shape and size in de novo designed proteins” further explains methods for systematically varying protein architecture inspired by nature. Such finesse is needed in optimizing designed proteins to take on exact shapes to perform specified functions. This work has been led by Baker lab graduate student Yu-Ru Lin in collaboration with Nobuyasu Koga at the Institute for Molecular Science in Japan. 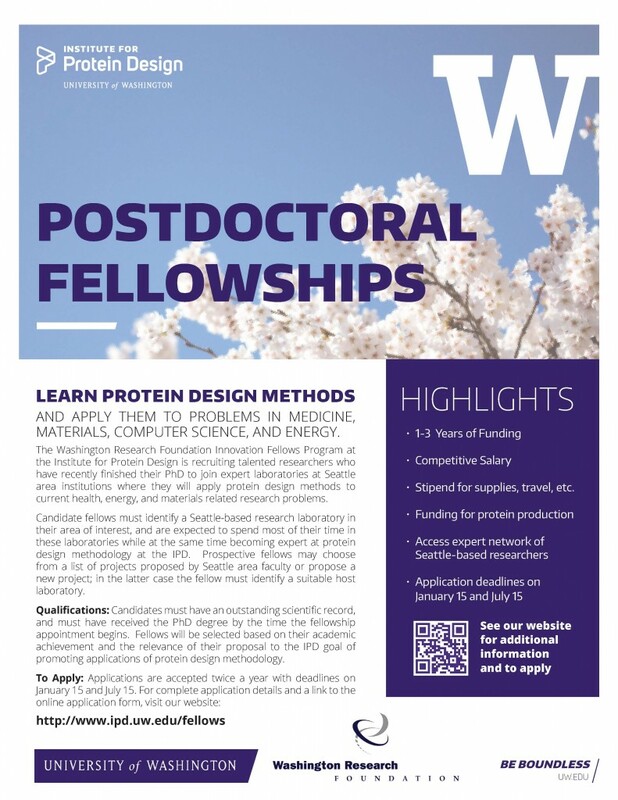 The Institute of Protein Design has been funded by several federal agencies, including National Institutes of Health, U.S. Department of Energy, National Science Foundation, U.S. Defense Threat Reduction Agency, and U.S. Air Force Office of Scientific Research, the Washington Research Foundation, the Life Sciences Discovery Fund, as well as through private support. 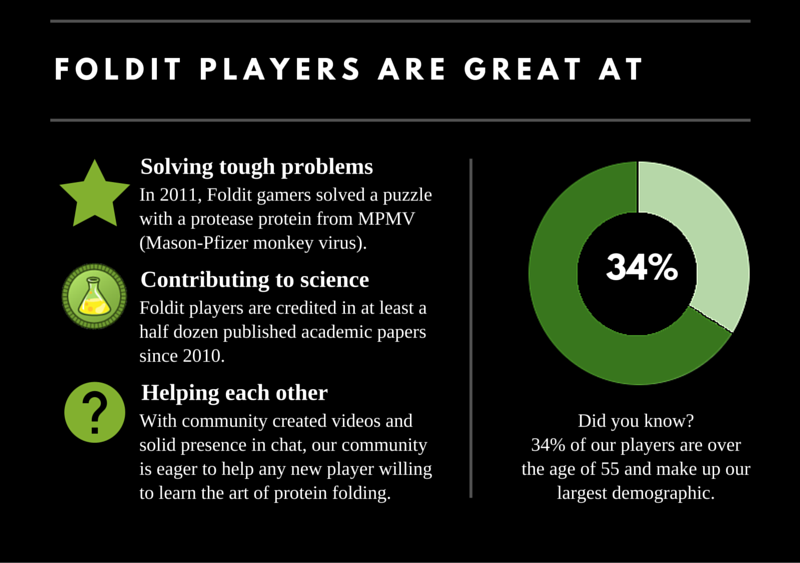 The Institute also depends on a cadre of citizen scientists around the world who volunteer their personal and computer time for protein folding prediction studies through Rosetta@home and the multi-player on-line protein folding game Foldit. A similar story was also published in UW Health Science’s Newsbeat. Read it here. 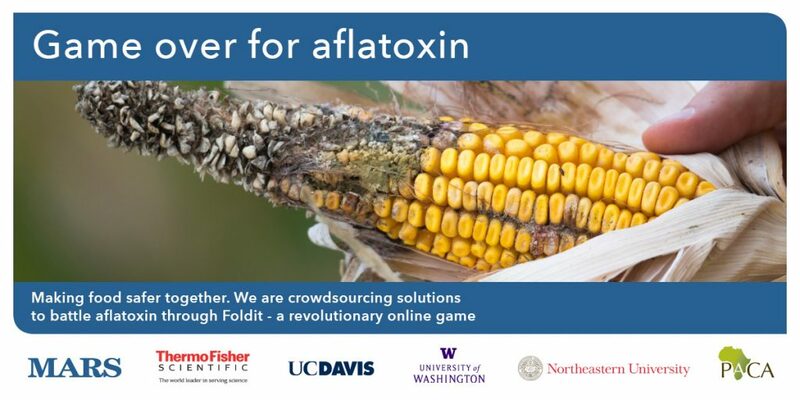 The Foldit community to targets Ebola. Click here to learn more. Watch grad student Brian Koepnick and IPD Director David Baker talk about this work on this KOMO TV news segment. Make a donation to help us fund our anti-Ebola effort. 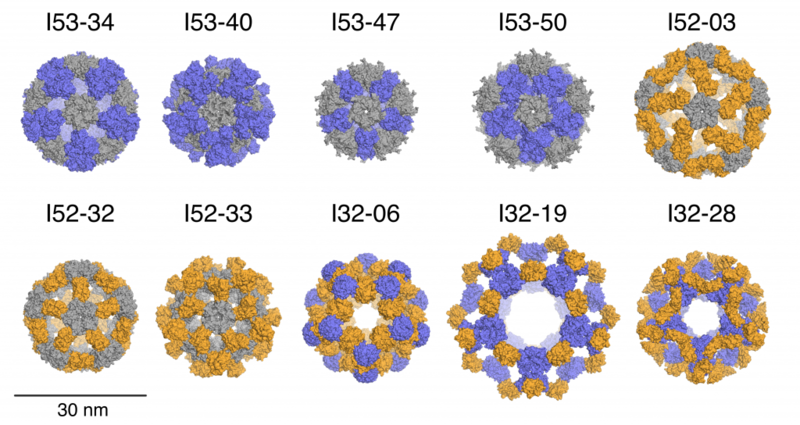 A new paper is out in the June 5 issue of Nature entitled Accurate design of co-assembling multi-component protein nanomaterials. Scientists at the Institute for Protein Design (IPD), in collaboration with researchers at UCLA and HHMI, have built upon their previous work constructing single-component protein nanocages and can now design and build self-assembling protein nanomaterials made up of multiple components with near atomic-level accuracy. Learn more about this innovative work at this link. Purification of antibody IgG from crude serum or culture medium is required for virtually all research, diagnostic, and therapeutic antibody applications. Researchers at the Institute for Protein Design (IPD) have used computational methods to design a new protein (called “Fc-Binder”) that is programed to bind to the constant portion of IgG (aka “Fc” region) at basic pH (8.0) but to release the IgG at slightly acidic pH (5.5). Published on-line at PNAS (Dec. 31, 2013), the paper is entitled Computational design of a pH-sensitive IgG binding protein, co-authored by Strauch, E. – M., Fleishman S. J., & Baker D. Learn more at this link. 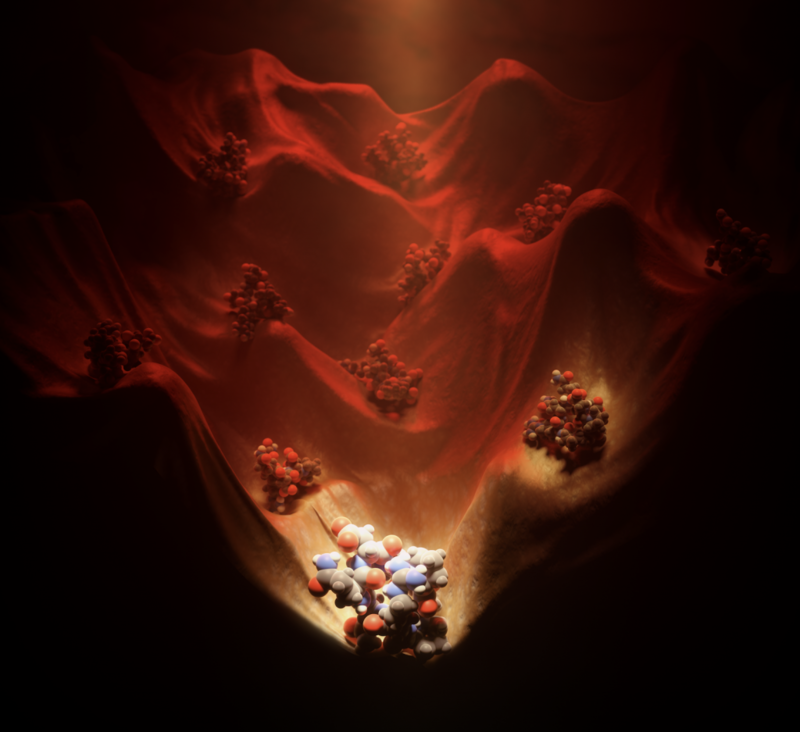 Researchers in the Baker group describe an improved method for comparative modeling, RosettaCM, which optimizes a physically realistic all-atom energy function over the conformational space defined by homologous structures. Learn more at this link. 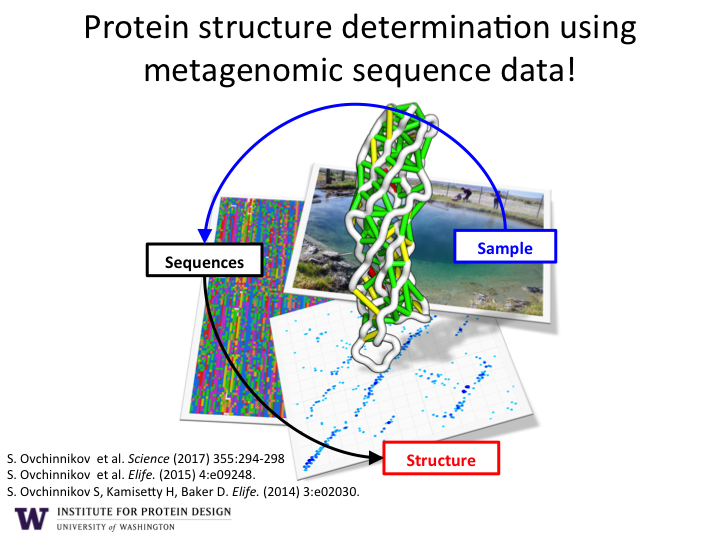 IPD researchers in the Baker group have published new computational protocols for preparing protein scaffold libraries for functional site design. Their paper entitled “A Pareto-optimal refinement method for protein design scaffolds“ improves the search for amino acids with the lowest energy subject to a set of constraints specifying function. Learn more at this link. Dr. David Baker, Director of the IPD delivered the Centenary Award and Frederick Gowland Hopkins Memorial Lecture at at the MRC Laboratory of Molecular Biology, Cambridge, UK, on December, 13, 2012. Baker’s lecture entitled “Protein folding, structure prediction and design” can be read at this published link. See: Baker, D. (2014). 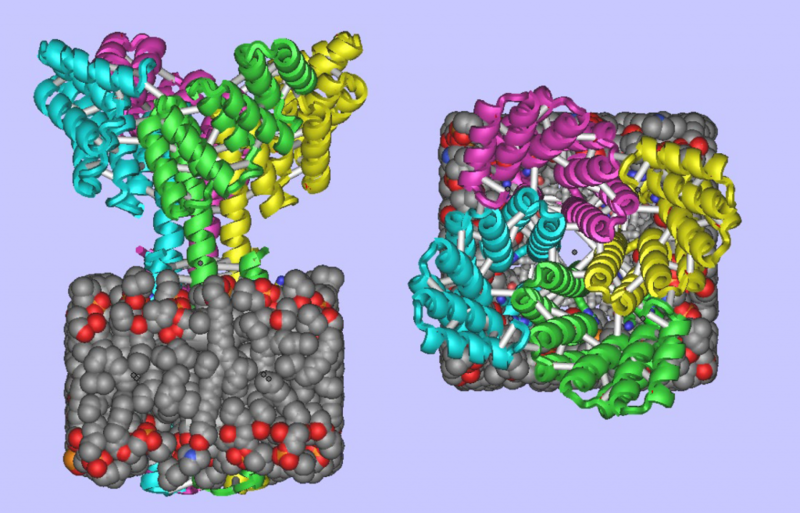 Protein folding, structure prediction and design.. Biochemical Society transactions. 42(2), 225-9. 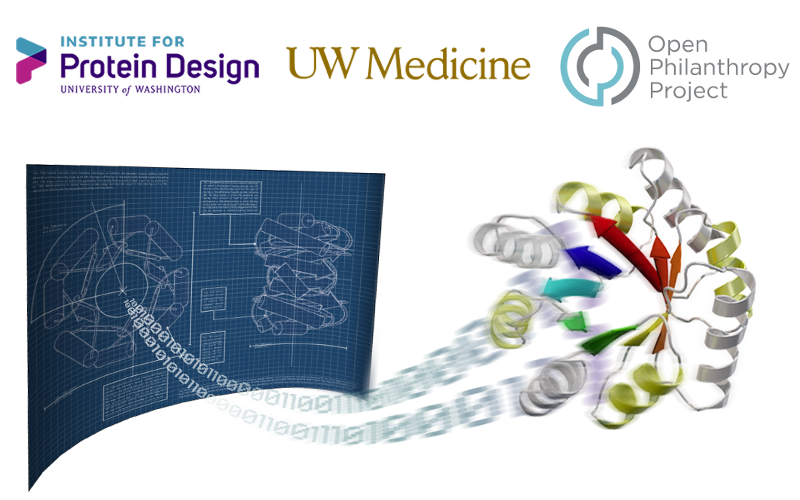 The Institute for Protein Design and David Baker’s laboratory have moved into the new Molecular Engineering & Sciences Building located in the heart of the University of Washington campus. Read about the Institute’s new home and its exciting research in the Seattle Times, and also at this link. As reported in Nature Biotechnology, David Baker and scientists at the IPD published exciting new methods to improve the potency and breadth of computer-designed protein inhibitors of influenza. Learn more at this link. IPD researchers in the Baker group have published in Science a paper entitled “Computational design of self-assembling protein nanomaterials with atomic level accuracy.” They describe a general computational method for designing proteins that self-assemble to a desired symmetric architecture. Protein building blocks are docked together symmetrically to identify complementary packing arrangements, and low-energy protein-protein interfaces are then designed between the building blocks in order to drive self-assembly. Read more at this link.